economic growth, which can alone lift one-third of the country’s population from below the poverty line, the country should have a strong supportive infrastructure. This includes ports to be made comparable with the “best international ports in terms of performance and capacity” along with good road and rail connectivity with the hinterland. In the year ended March 2014, Indian ports, including 13 major (arbitrarily so described) and 200 non-major ones handled 976mt (million tonnes) of dry bulk, liquid and containerized cargoes against 933.66mt in 2012/13. The issue of arbitrariness arises because some of the so-called non major ports not only have bigger capacity than the major ones but they also have massive expansion programmes actively pursued. To give one example, soon after the acquisition of Tata Steel and Larsen & Toubro promoted Dhamra Port on India’s eastern coastal state Orissa in May 2014, Adani group said in less than three years it would expand the port capacity from 25mt to 100mt. The expansion will require building 12 new fully mechanized berths to the two operating now handling dry bulk cargoes like coal and iron ore.
Acquisition cost of Dhamra was Rs55bn ($887m) and Adani will be required to spend in multiples of that to achieve 100mt capacity. By replicating the success the group has achieved with its port on the western coast in Gujarat, it is confident of becoming a “200mt ports business ahead of 2020,” says chairman Gautam Adani. An official of Orissa government told Dry Cargo International, “wait for a while, you will see great things happening with Gopalpur port once Tata Steel gives shape to its multi- product special economic zone project over 3,000 acres of land.” The advantage with both the ports and also with the vibrant Paradip Port in Orissa is the availability of deep hinterland highly rich in natural resources like coal, iron ore, chrome and manganese ores and bauxite and farm products. All this besides, the hinterland houses some very large producers of steel, aluminium and ferroalloys. They all need good access to ports and efficient handling of inbound and outbound cargoes. The last government headed by Dr Manmohan Singh formulated a perspective plan for the maritime sector running through 2020 in consultation with all stakeholders. Hopefully, the plan will hold good in the new regime. The three principal objectives of the plan are: (i) build capacity of 3,200mt for the ports to handle an expected traffic of 2,500mt. (ii) Local and foreign shipping lines and shippers want considerable improvement in port and related services at several Indian ports. Full mechanization, a shift to computer-controlled operation and major labour productivity improvement will bring Indian ports at par with the best international ports in terms of performance. (iii) Besides a 7,510km-long coastline, the country is criss- crossed by a good number of mighty rivers, including the Ganges, the Brahmaputra and the Narmada flowing into the Bay of Bengal or Arabian Sea. A number of committees in the past have said that the country stands to save on fuel and thereby restrict carbon emission and avoid a good deal of road decongestion if well-dredged rivers are used for goods transfer from one point to another. The perspective plan wants coastal shipping to be promoted in a big way. Speaking to Dry Cargo International, an official of Confederation of Indian Industry (CII) said “the Indian port sector offers many investment opportunities to build greenfield port projects, preferably deep sea all-weather ones along its long coastline and in terminals and berths.” Government-controlled and also privately owned ports are open to offer space to groups to build berths and terminals for captive use. The task of raising port capacity from 1,430mt to 3,200mt in a short span has made it imperative for the government to invite private sector to invest in a “very big way” and thankfully it is obliging. The CII official said the states must be proactive in making available large tracts of land the way Gujarat had done in the case of Adani and Pipavav ports to realize the country’s ambitious capacity target. Dredging and connectivity between ports and hinterland also offer major investment opportunities to the private sector. Draughts in major ports are between 10 and 14 metres. The shipping ministry wants the draught in all major ports to be over 14 metres and more than 17 metres in hub ports. The task is too big for the government-owned Dredging Corporation. Foreign investment will be particularly welcome in this area. Shippers go on asking the government to give priority to make all ports to be connected with hinterland by at least four lane roads and double rail line. Isn’t cargo traffic to ports slowing down because of 35% dependence on roads? The available situation calls for adequate nodal shift to railways, coastal shipping and inland waterways from roads. In the meantime, feasibility studies are ready for building a deep draught port at Sagar Island in West Bengal with capacity of 54mt and requiring an investment of Rs78bn and Dugarajapatnam port in Andhra Pradesh. The latter will have capacity of 25mt in the first phase. The outer harbour project at Tuticorin port in Tamil Nadu conceived to bring in coal from Australia, Indonesia and other places to make the southern state a major power hub with capacity of 15,954MW is among the country’s most ambitious port projects. Execution of 97.5mt- capacity in the first phase will call for an investment of Rs72.41bn in breakwaters and capital dredging and nearly Rs44bn in berth construction. Being close to many international shipping routes,Tuticorin port since renamedVO Chidambarnar is strategically located for coal imports. Coeclerici’s Logistics Division, which specializes in providing custom-built marine solutions, including dry bulk transshipment services, spotted an opportunity in India in early 2000. At that time, Indian ports were facing severe draught restrictions, coupled with slower handling rates. After detailed discussions with large industrial customers, Coeclerici therefore designed a solution customized for the Indian market. The solution was designed to overcome their respective logistical constraints. In the year 2002, Coeclerici’s Logistics Division delivered India’s first Floating Transfer Station (FTS) Bulk Challenger to Mumbai for discharging the dry bulk cargo of Ispat Industries Limited (now JSW Steel). With the booming Indian economy in 2006, Coeclerici continued to expand its presence in India by partnering United Shippers Limited (USL), one of the largest stevedoring firms in India operating at various ports on the West Coast of India. Coeclerici invested in USL becoming its shareholder and the duo partnered in conceiving a new project capable of performing both loading and discharging operations mid-sea, a feature which made newly built FTS Bulk Prosperity uniquely different from standard transshippers. Coeclerici designed the new FTS Bulk Prosperity which was capable of performing both type of operations i.e. discharging any kind of dry bulk cargo from vessels up to Capesize into the barges, as well as loading from barges into vessels up to Capesize. It also has capacity to store about 10,000 metric tonnes of cargo in its hold and its propulsion system helped in moving the FTS from one location to another on its own power and without assistance of tugs. The duo delivered Bulk Prosperity in 2008. The unique flexibility offered by the unit led to its usage in different ports for different operations and handling different cargoes. While it discharged iron ore/coal/coke from the Capesize vessels of Essar Steel at Hazira near Surat, it also loaded iron ore and bauxite for Fomento Group/Vedanta (Sesa Goa) and Ashapura Minechem at Goa and Bedi respectively. Bulk Prosperity was able to handle cargo at a net rate of up to 18,000 metric tonnes per day unloading, and up to 20,000 tonnes/day loading. The Bulk Prosperity was amongst the first FTS to operate during a monsoon at mooring dolphins installed by Mormugao Port Trust. The Indian economy continued to grow and coal imports kept increasing. Spotting an opportunity to meet the additional handling requirements of coal importers, Coeclerici, along with its partner USL, decided to develop a custom-built facility that could meet coal importers’ expectations and at the same time render valuable services to their supply chain. 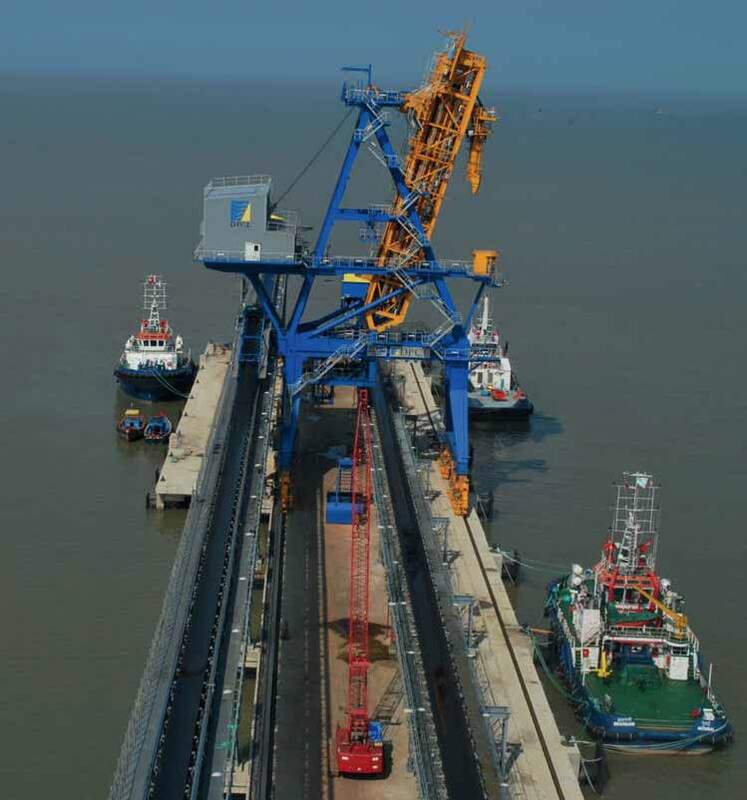 The duo decided to construct a floating crane in India to meet the above requirement. The brand-new floating crane Uniglory started operations in Indian waters in the second half of 2012. Uniglory handles cargoes for various coal importers such as Essar Group,Vedanta (Hindustan Zinc), Jayprakash, Adani, Reliance, etc in the ports of Bedi and Navlakhi. The transshipment concept has started gaining interest amongst Indian coal importers. Sustained coal imports, coupled with congestion at deep water ports/ restricted availability of deep water ports, increased the use of transshipment facilities in India for coal discharging. This situation brought the partners to hire four floating cranes from the market. The combined usage of these floating cranes could result in achieving discharging rate up to 25,000 tonnes/day. Transshipment services have helped Indian coal importers to make savings, reducing ocean freight cost, resulting in lower import bills and also streamlining their supply chain. India now has about 30 transshipment facilities which help in overcoming draught restrictions at ports and help Indian importers/exporters in loading/discharging vessels up to Capesize. Coeclerici’s Logistics Division has, to date, handled more than 8mt (million metric tonnes) of cargo through its various transshipment facilities. in a minor port operating company and is also actively involved in coal trading supplying thermal coal, coking coal and coke to Indian customers. Coeclerici Group was founded in Genoa in 1895 and is celebrating its 120th anniversary this year. Coeclerici’s business division include Logistics,Trading Mining and Shipping. Coeclerici – Logistics Division has transshipment facilities operating in Indonesia, Mozambique and India. It handles about 25mt a year of cargo mainly coal, iron ore, sulphur and bauxite. It also owns and operates high-speed boats in Venezuela. Coeclerici has an in-house project team looking after engineering, design, construction, supervision during construction and operations of custom built marine assets owned and operated by Logistics Division on long term contract with large industrial customers. The Coeclerici Group is headquartered in Milan with offices in Amsterdam, Beijing, Caracas, Jakarta, Lugano, Moscow, Mumbai, Novokuznetsk, Singapore and Sydney. Since its formation in 1977, Bothra Group has evolved from a conventional stevedoring, clearing and forwarding agency to a multidimensional shipping and port logistics group of companies. The group and associate companies have since gone global with operations in Singapore, China, the Far East, Indonesia, India, Middle East & African continent. Bothra Group enjoys a reputation beyond the shipping sector as a competent and reliable end-to-end logistics service provider with shipping and overland logistic solutions tailored to customer needs. In recent times the group has focused on mechanization of its cargo handling activitiesat Kakinada. Bothra Group handles the majority of dry bulk cargo in Kakinada Deep Water Port (KDWP). In October 2011, Bothra Group and Kakinada Seaports Limited together commenced construction of a state of the art 8mt (million metric tonnes) per year mechanized coal handling terminal at the 5th Berth of KDWP. KDWP Coal Terminal was commissioned in October 2013 and within the first year of operations exceeded the projected traffic and handled over 6.9mt of coal till end of December 2014. Bothra Group and Kakinada Seaports Limited are now close to commissioning a 6mt per annum mechanized fertilizer handling terminal at the 6th Berth of KDWP. The KDWP Fertilizer Terminal features completely weather-protected railway sidings, a warehouse and an automated bagging system. The KDWP Fertilizer Terminal features a warehouse covering 72,450m2 (18 acres) of floor space under a single roof, sufficient to store 400,000 tonnes of fertilizer cargo at any time. At 84 metres wide and 862.5 metres long, the warehouse is large enough to shelter 11 Airbus 380s. Discharge operations through this terminal were recently commenced in October 2014 and the bagging and dispatch system will be commissioned by April 2015. KDWP Coal Terminal and KDWP Fertilizer Terminal have revamped the way dry bulk cargo is handled in the port of Kakinada. Bothra Group’s focus on mechanized cargo handling and faster turnaround time of vessels has brought new clients to Kakinada Deep Water Port and strengthened relationships with existing clients. As part of the group's efforts to provide innovative logistics solutions and services to its clients, the group also provides end-to-end logistics services. Bothra Group has been providing this service to many of its esteemed clients including Andhra Pradesh Power Generation Corporation (APGENCO, a Govt of Andhra Pradesh undertaking) for the last many years. Under these services Bothra Group oversees the entire movement of coal cargo for APGENCO’s thermal power plant in Vijayawada. For APGENCO, Bothra Group co-ordinates and supervises activities from the loading of coal into railway wagons at Talcher, unloading from wagons at Paradip, loading into vessels, coastal movements from Paradip to Kakinada including chartering of vessels, unloading from vessels at Kakinada Port, loading dispatch in trucks or rakes up till delivery at APGENCO’s power plant. Annually at least 3mt of APGENCO’s coal is handled by Bothra Group through its end-to-end logistics model. The group has emerged as a strong player in the logistics sector on the east coast of India and continues to evolve and move from strength to strength.